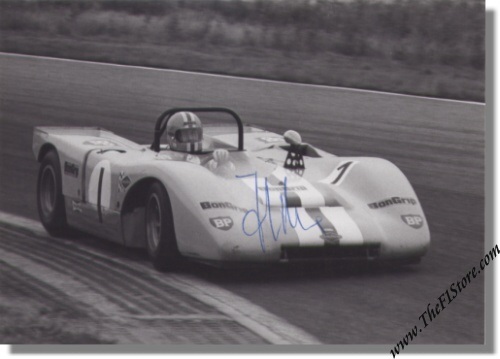 1972 Joakim Bonnier Signed Lola T292 Postcard. Joakim Bonnier (1930 - 1972) signed photo of him in his Lola T292 (probably the same car in which he was killed at Le mans 1972). This photo was taken at an unknow event. Signed in person by Jo. 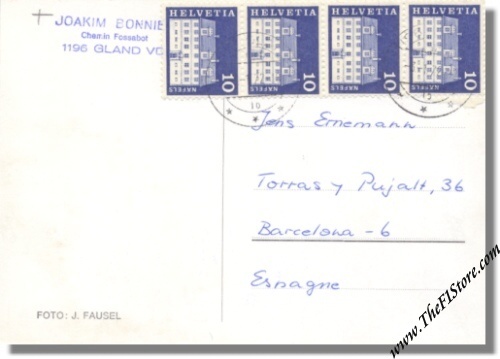 This is a postcard that was sent by Jo to a fan in Spain on January 3, 1972 (see scan) a mere 5 months before his untimely end at Le mans. It carries Jo's address in Geneva, Switzerland on the back. The photo measures some 15 x 11 cm or 6 x 4.5 inches.